Vienna, June 26th, 2013; Following last year's success, the art park in the gardens of Villa Bulfon opens its gates for the second time, from July 1st until August 26th. The focus of the exhibition that is set in the impressing park is laid on sculptures, complemented with works of contemporary art . Robert Schad, Hans Kupelwieser, Joana Vasconcelos, Kevin Francis Gray, Julie Hayward and Dorothee Golz are part of the 20 sculptors who will show their work in the exhibition that will be opened until the end of August. Lisa Kandlhofer, director of the Gallery "Lisabird Contemporary", and Helmut Feier, "CastYourArt" bring a great number of young and talented, as well as renowned artists of great international reputation to Velden at the Wörthersee. Three hectares of parkland and the rooms of the old casino in Velden form the setting for the Artpark Villa Bulfon.This year's focus is set on the topic of "body and form within space". The official opening of the "Artpark Villa Bulfon" will take place on Sunday, June 30th at 7 p.m. with the opening speech given by Agnes Husslein-Arco, director of the Belvedere. The art duo Karl Karner and Linda Samaraweerová will perform an impulse dance. Their performance project "grünwachs ein" analogically deals with this year's topic in the art park, with space. Lisa Kandlhofer: "We are very happy to be able to contribute to art and culture at Lake Wörthersee this summer again. Amongst the artists, there are many highly promising talents. Furthermore, we could win some famous artists of international reputation for our projects, such as Kevin Francis Gray, Harland Miller and Robert Schad." This is proof of the respect that the artists show for the projected aim to position extraordinary art at the "Location Lake Wörthersee". Wolfgang Waldner, highest cultural official of Carinthia, is impressed by the project: "The art at the lake meets our claim to link art and culture to tourism and to raise the image of Carinthia as a cultural county. With our new culture of welcome we want to demonstrate the necessary openess to do so." Special thanks for the financial support of the Project to the Carinthian Electricity Incorporated Company KELAG and Frank Stronach. How art submits to space, breaks and boosts it, and how it modifies it within the audience's perception, is all focused on by the exhibition in 2013.Helmut Feier: "The park of Villa Bulfon, rich with tradition, functions as a powerful place for young art. 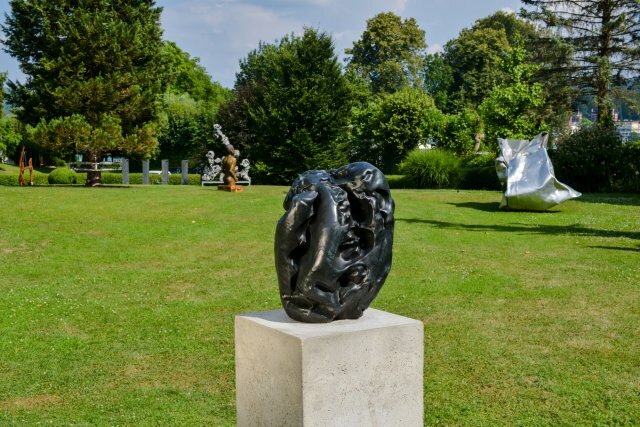 On one hand, we make contemporary art that can normally be beheld only in museums accessible for free for all people with an interest in it, and, on the other hand, we offer the artists the chance to exhibit their large-size works within the parkland. Furthermore, we support them in the expensive and labour-intensive fields of transportation, as well as construction and reconstruction of the sculptures."